The Chronicles of Ruthie Hart: How do you connect with your spouse? Lately I feel like we've been juggling a circus over here. Between work, blog, church, friends, baby prep, house stuff.. it's been busier than normal yet I feel so much more at peace. I've gone through stages in this pregnancy of falling asleep at 8pm to having much more energy and staying awake, I swear it changes by the week. But the past week has been full yet at ease and I can pinpoint exactly why.... Jon and I have not watched TV. Last weekend we watched a few movies on Netflix during the day but in the evenings got the urge to just hang out. We've been taking Ernie on longer (and much slower walks for this waddling mama) walks, staying at our dining room table even after we finish eating, and playing lots of games. If you know us in real life, you'd know we are game people. We love outdoor games, board games, pretty much all games with the exception of video games (except for the Wii). In the past week we've played multiple rounds of cards, marbles (a hand made Sorry type game that usually requires 4 people but we improvised), every single game on Wii sports resort, Family Feud, the Price is Right. It has been seriously the most fun we've had on weeknights in a while. I am so behind on all my shows and we haven't watched a Breaking Bad episode in about a month but we are having a blast. Last year I talked about how we didn't get a TV in our room until we moved into this house so the first year of marriage we remained TV-less in our bedroom which was good for us, yet we would sometimes fall asleep watching movies on the couch so that defeats the purpose. We definitely go through seasons where we are really into a show and get excited to cuddle up in bed and watch it until we doze off but I love the sans-TV season we are in now. It could and most likely will change next week but I have just been thinking a lot this week about what a distraction TV can have on a relationship. We've always had a rule that we eat dinner at the table without the TV on and we switch off choosing a Pandora station to listen to. I hate calling it a rule because it's not something we dread. We will continue this when we have children too. I think about the last week and instantly recognize a deeper connection between me and my husband, the more fun the conversation, longer the laughs, and sweeter the physical touch. All because we turned off the TV! Some of these moments are bittersweet knowing that in just a few months, the physical demands of our son will get in the way of nights focusing on each other...but I know those times will be just as sweet. I savor the long walks we've been taking knowing that the weather is about to become unbearable, but I get so excited thinking of the walks we will take with our baby boy. The seasons of marriage are ever changing and I'd love to know how you and your spouse connect during those sweet seasons. Or how you 'get back on track' after a distracting season of marriage. And just for fun...I saw this on Facebook...I'm not a mama yet but can see myself saying this! Just saying, I would love to sleep like my husband while I'm pregnant too! 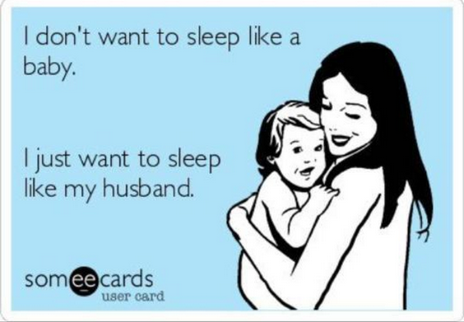 No middle of the night waking up just to roll over or make several trips to the bathroom :) I think it still applies! I was also JUST talking to my husband about how tv really keeps us from connecting...he views watching tv together as "quality time"....not so much. Hoping we can make some changes here soon! Thanks for the encouragement! Thank you for this post! My husband and I are such TV junkies. We keep saying we need to get rid of it and focus more on each other and our little man. Love all your games you two play! haha love the ps... so funny! I'm sooooo in to games, but Scott isn't :( I'm hoping to ease him into playing with me. I get so much joy from doing little things like that. We have been eating at our dining table as well. It's amazing what a difference it makes. I find, like yall, there are times where we have kept the conversation going well past the end of the meal. As the mom of a 17 month old, I can asure you that by being aware of wanting to keep that connection going after the birth of your son, you will. We LOVE playing games together too! Sometimes it can be hard with just two people, but improvising always works. We even asked for the "nice" set of vintage style games from Target for our wedding...love me some chinese checkers, yahtzee, scrabble, sorry, and uno! Loved this post, Ruthie!! Very encouraging! We have an almost 1-year old and another due in September and keeping our marriage in check is a main priority of mine. We are strict with bedtime and then in the evenings we will take a nonsexual bath together (haha, if that makes sense! ), read (currently reading The Love Dare) and talk about our days. We are guilty of falling asleep to the TV though (it's in our room, something I'm considering changing but I think if we didn't have it my husband would stay up later than me watching TV downstairs and I'd go to bed. Now at least I can fall asleep next to him). Anyways, thanks for the encouragement!! We love games too but I forgot about them lately! Love this post so much. We started doing the "no tv" during dinner thing a couple weeks ago and I have loved every minute of it. The nights are staying lighter longer and walking Rocky together at night is one of my favorite things. Such a good reminder to take tv out of our lives a bit..completely agree with you! Haha! In love that he IMd you from the same house to play a game. I can NEVER get work done when Micah is home because of his antics. we reconnect with date nights. they are a MUST with a baby. love ya! i think it's definitely important to reconnect every once in a while. We do have a TV in our room, but I like it that way because my husband stays up later than I do, so this way at least he's in bed with me when I fall asleep and not downstairs on the couch! You will soon find that with the new baby, there will definitely be some adjusting to be had in order to spend time with Jon again. But as long as you can keep that a priority I think you'll be fine. 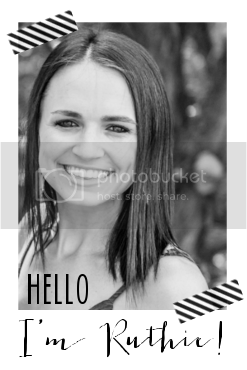 the first few months are hectic but once you are into a routine it will be so much easier! We have two kids who are 9 & 6 and we do not have the TV on at dinnertime - it's just too much of a distraction with it. This way, we are able to pray before our meal, and discuss our days and anything exciting/troubling/interesting that happened. With the TV on, nobody wants to pay attention to each other! As long as you make an effort, it will work. And a baby brings you together like you can't believe. Hehe love this! Especially the P.S! Date nights are so important. I love every chance we get to have a date night. :) Oh and that "Somee card" LOL! That made me laugh. It's so true. Leon doesn't get up with the baby at all. I don't really see a point in it considering he has nothing to feel her with! ;) Love ya girl!